Ancient bronze Celtic cross plus intriguing young woman with butterfly tattoo on her bottom equals big trouble for Roly O'Leary. 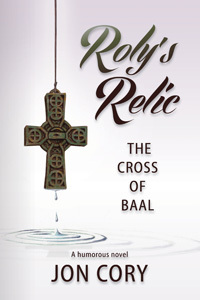 Baby-boomer salesman discovers a fabled Celtic cross reputed to fulfill innermost desires. Is the cross a magical ancient relic or a hoax? He runs afoul of assassins, and falls in love with an enigmatic young woman. Will she break his heart? Available from Amazon in printed format and Kindle Edition. Roly O’Leary discovers an old Celtic cross while on a trip to the small town of Bordum Grove, Tennessee. Little does he know that the cross is the sacred relic of an ancient band of assassins who want it back. Murder and mayhem follow. Roly loses both the relic and his heart to Gumby, a college dean’s young assistant. The enigmatic beauty holds the cross for ransom, challenging the wonderfully terrible Mr. Pimm and his rookie hitman, Kenny. Can Roly find the cross and save Gumby? Does the fabled Celtic cross have the power to fulfill its owner’s innermost desire or is it a hoax with a dubious history?